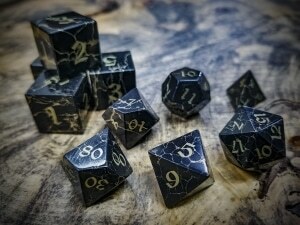 These particular dice, have been crafted from Jet and inlaid with Brass. Jet also known as lignite, derives its name from the French word, jaiet, and gives its name to the term, jet-black. Jet has been widely used as a gemstone since the Neolithic period and examples of jet jewelry have been found in Germany dating to 10,000 B.C. The Romans found a love of Jet in the 3rd century, but its use fell out of fashion until the Victorian Era once Queen Victoria herself adorned her mourning dress with jet after her husband’s, Prince Albert, death. Jet despite its historical use as a gemstone, isn’t really a gemstone. Jet is in the same family as pearls and amber, since it is an organic material. Jet is formed from super compressed decayed wood mixed with a touch of salt water then cooked for eons in the warm bosom of Earth’s crust. Much like the Lapis and Malachite dice, these have pleasant weight to them and a smooth, cool surface. Unlike those other dice, the brass inlay provides a quick to read, high contrast numbering. 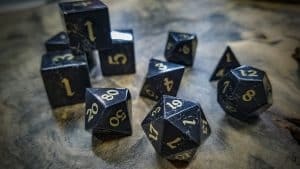 I’m really going to enjoy playing with these. glad you like them brett! 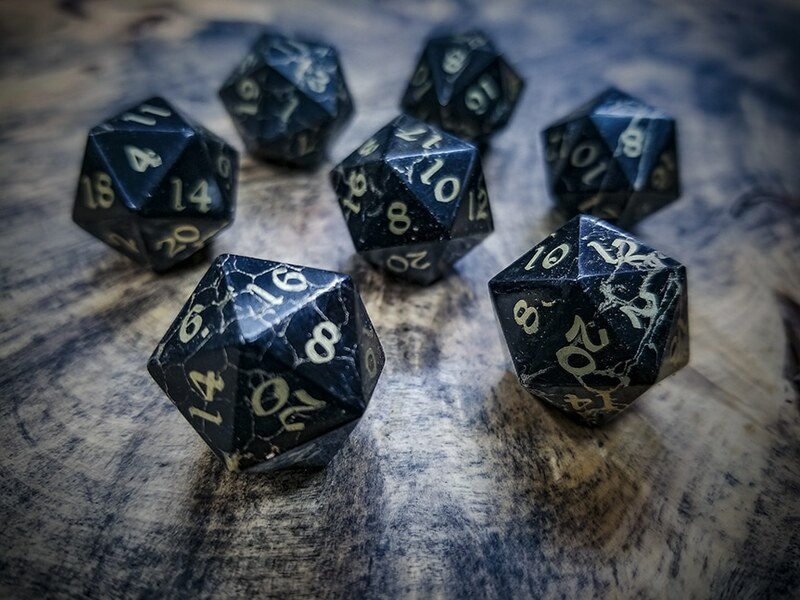 these new elemental dice are some of our favorites too.